Chicken and waffles isn’t the strange combo it once was, with bird-and-waffle joints popping up from Long Beach to Brooklyn. Rumor has it the dish dates all the way back to the time of Thomas Jefferson, who brought the first waffle iron from France in the late 1700s. Fried chicken was already a common Southern breakfast, often paired with a bread like flapjacks. While there is a lack of historical evidence for an original recipe, it is thought the recipe was eventually brought North and became popular in Harlem during the early 20th century. Herb Hudson, a Harlem resident, brought the dish to the mainstream after opening Roscoe’s House of Chicken & Waffles in Hollywood, Calif.
Hudson has since opened several other locations around California, though I was eager to try the original establishment. I arrived at the Hollywood location on a late weekday afternoon, with the place moderately filled. I’m a big fan of sweet and savory combos, though if you’re not into it, there are plenty of soul food options available on the menu. Looking for a classic Roscoe’s experience, I ordered a Country Boy combo, also known as the Obama Special, with three wings and a waffle, in addition to a side of sweet potatoes. The staff was friendly and brought out my food quickly. While I’ve had better fried chicken for the price, Roscoe’s certainly knows what they’re doing, sticking with a small-batch method utilizing cast-iron pans, the proper Southern way. The meat was juicy and had a crisp, perfectly seasoned skin. They paired well with the waffles, which were much softer than your typical Eggo, and added just enough sweet to the savory. Toward the end of the meal, all your food starts mixing together a bit, creating a weird but tasty concoction of chicken, hot sauce and maple syrup. My sweet potato side was the perfect accompaniment for the meal, leaving barely any room for a piece of cornbread before I left. 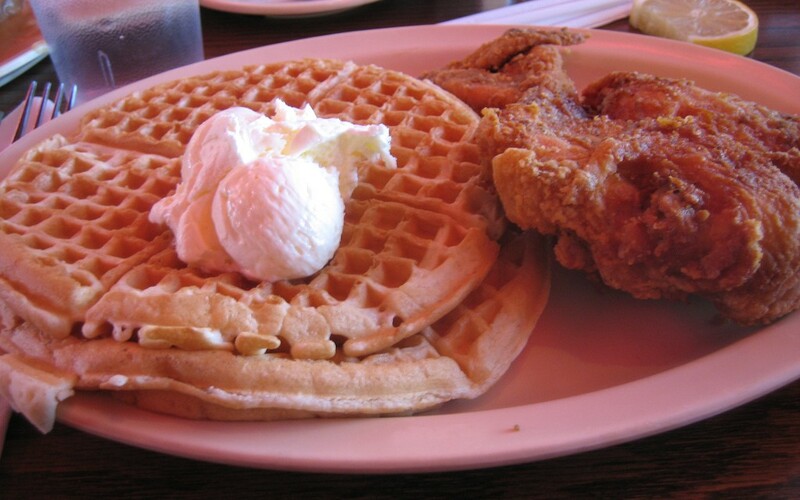 All in all, Roscoe’s is a classic Los Angeles establishment that is definitely worth the visit. While there are better bird-and-waffle joints popping up across America, the Roscoe’s experience can’t be duplicated and will leave you satisfied.